I’ve written ad nauseum that the most energetic and effective anti-Zionists are Jews, not Arabs or Muslims. A perfect example is the group called “A Jewish Voice for Peace” (JVP), based in the San Francisco Bay Area, but with chapters all over the country, mostly on college campuses. JVP has been growing by leaps and bounds, with their 2011 form 990 (a tax form which all non-profits are required to make publicly available) showing an income from contributions and grants of $871,250. This is very big money for an organization whose membership appears to be mostly students and young people, and there is reason to believe that they have recently started to receive much more. Unfortunately non-profits that don’t give money to political candidates are not required to disclose the identity of their donors. Ads like these cost between $400-$950 per ad for 4 weeks, depending on “timing and market.” So let’s say (very conservatively) that they are paying $250 per ad for two weeks. Their 100 ads cost them at least $25,000, probably twice that. JVP likes media attention, and one of its favorite tactics is to disrupt pro-Israel speakers and events. Both the advertising and the disruption appear to be intended at least as much to attract attention — and recruits — to their organization as they are to change public opinion about their issues (promoting boycott-divestment-sanctions, portraying Israel as an apartheid state and human-rights violator, etc.). Here is something else that I noticed on JVP’s form 990, which supports the idea that it is focused on growth. It has only one paid officer, Executive Director Rebecca Vilkomerson, who is listed as receiving total compensation of less than $75,000. But they also list $355,090 in “other salaries and wages.” Who are the additional employees? What do they do? It’s not the janitorial staff of JVP’s small Oakland office. My guess is that they are organizers stationed on college campuses and other places where young Jews can be found. Although the organization wants to give the impression that it is an all-volunteer, ‘grassroots’ group, it seems that it is actually a disciplined professional operation that is rapidly growing. Their grants and contributions have increased by an average of more than $100,000 a year (with the exception of 2008, a bad year for all nonprofits). A check into OSF 990s for 2010 or 2011 show no grants for Avaaz nor Res Publica. According to its 2011 990, Avaaz.org’s total revenue for that year was $7,519,028. Avaaz.org claims it is “wholly member-funded.” Avaaz does not publish a detailed list of donors on its website or 990 forms, and therefore this claim cannot be verified independently. 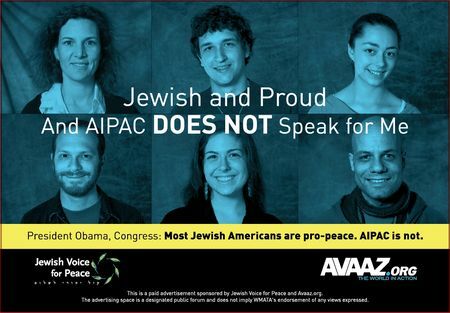 Avaaz, with its huge budget, is as slick as it gets (here is a discussion of how it managed a fake grassroots Internet campaign for Palestinian recognition). My guess is that Soros is getting behind JVP as well, and with the same objective: to create a ‘popular’ Jewish anti-Zionist movement. Soros, in other words, is pitching a whole line of anti-Israel merchandise to Jews. Are you a progressive who wants to distance himself from Israel along with your left-wing friends, while still remaining a member of your (liberal) synagogue? Buy some J Street! But suppose you want to see Israel replaced by an Arab state and don’t care who knows it — if you are suffering from stage-4 Oslo Syndrome — then JVP is for you. There is a reason why so much of the heavy artillery of anti-Zionism is turned on the American Jewish community. True or false, it is seen as the key to American support for Israel. Will Obama repudiate support from anti-Israel rabbis? I’ve been away for a couple of days, and today’s news is ugly. Hizballah is practicing for an invasion of Israel, Iran is enriching uranium even faster than hitherto thought, and more than 600 rabbis have endorsed Obama’s reelection. OK, that last one is not as alarming as the first two. They are almost all Reform and Reconstructionist rabbis, and we know that they tend to be Democrats. Many of them probably prefer Obama for other reasons than his policy towards Israel. But several Jewish bloggers have noted that eight or nine of them are associated with A Jewish Voice for Peace (JVP), one of the ADL’s “Top Ten Anti-Israel Groups in America,” the only Jewish organization on the list, and one that aggressively pushes boycott-divestment-sanctions of Israel on campuses and municipalities, and among liberal Christians. JVP also calls for a ‘right of return’ for millions of Arabs claiming Palestinian ‘refugee’ status, which means an end to the Jewish state (and doubtless to many lives in the ensuing civil war). We’ve been living with a nuclear Israel which used conventional weapons on people. We’ve been living with nuclear India, with nuclear Pakistan, nuclear United States. Do we want to live with any government having nuclear power? I don’t think so. I personally do not want to live in a world with nuclear weapons, period. It’s unfortunate that we have been valuing militarism and war over diplomacy and peacemaking. It’s a choice, a human choice. War is not inevitable. It is a choice. Are we doing everything we can to prevent war? I would like to see all our politicians act differently in this regard. The fact that they are trying to kill us is irrelevant, of course. I believe we all would be better off if we hold out as our goal getting past the ethnic state which has been and will continue to be the cause of so very much conflict and suffering — as well as the distortion and debasement of Judaism. I used to love the State of Israel and thought that it needed to exist. I no long[er] think that. In fact, I want our shared vision and goal to be enabling Jews to live in the Jewish homeland in a way that enables everyone there to be fulfilled as equal citizens of whatever state is organized by those people there to meet their common needs, i.e. not a “Jewish” state. …as a Jew I am growing increasingly heartsick that this [Israeli] culture has been and continues to be created on the backs of others. I am having a increasingly difficult time getting past the fact that our Jewish national rebirth has come at the expense of the Palestinians. And I am even more painfully considering whether these problems are not mere “blemishes” on an otherwise noble national project, but rather something fundamentally problematic with the Zionist enterprise itself. Apparently Obama’s people didn’t check who these rabbis were when they published their list. They should have. Most pro-Israel voters see JVP as an extremist anti-Israel organization. Will the President denounce JVP and its representatives? I doubt it. Consider the example of the Rev. Jeremiah Wright, whom Obama did not repudiate until several months after his anti-American and racist attitudes became public knowledge. This was a much bigger deal than a few pro-Israel Jews and Evangelical Christians who probably wouldn’t vote for him anyway. I’ve mentioned the Jewish Voice for Peace (JVP) organization before, and I’m particularly interested in where they get their money. Their 2010 IRS form 990 shows an income from public contributions and grants of $705,605, they have 6 paid employees and a payroll of $367,186. That is a significant amount of money, and it is deployed very effectively. 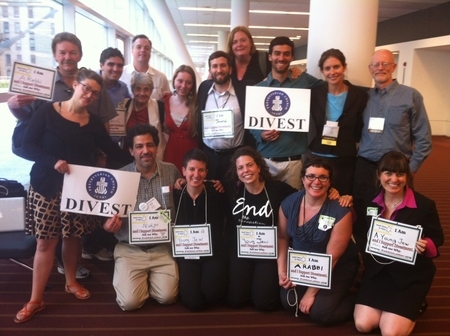 JVP is spearheading divestment campaigns in several arenas, such as the educational financial services organization TIAA-CREF, and of course on many campuses. As the Levy Commission recently found, Israel is not in violation of international law, and it is not occupying or colonizing “Arab lands.” JVP’s ideas of the ‘fundamental rights’ of Arab citizens of Israel goes far beyond what we normally think of as civil rights — for example, these ‘rights’ are said to be violated by Israel’s being a Jewish state — and UN resolution 194 does not require Israel to admit the grandchildren of refugees. Practically, does anyone doubt that an influx of up to 5 million claimants of refugee status to Israel will end the Jewish state? In many cases, Jew-washing is also used to whitewash the blatant theological anti-Semitism that accompanies the church-based BDS attacks on Israel. One example is Sabeel, a Palestinian Christian group that is very influential in those mainline churches active in the BDS wars. Its theology includes supercessionism – a reading of the New Testament that considers the Church to have superseded the Jewish people in God’s promises – and deicide – the charge that “the Jews” killed Jesus – that served as the basis for centuries of anti-Jewish persecution. Investigations of J Street’s funding showed connections to Saudi Arabian, Turkish and Iranian interests. JVP has been very secretive about its sources of income, but can you imagine what we’ll find when they slip up? Yesterday I wrote about how a Birthright reunion in New York was disrupted by anti-Israel demonstrators. If you haven’t seen the video, watch it now. Far more unsettling than the accusations they hurled at Israel — by now I’m used to the lies and expressions of hatred that accompany such protests — was the combination of robotic “mic check” chanting along with the expressions of glee, even laughter, from the antisemitic — yes, I said antisemitic, and I will support this — activists, as they interrupted a talk by author Steven Pease, doing their best to impose their totalitarian vision of what may and may not be heard on the audience. So who were they? They were members of “Young, Jewish, and Proud” (YJP), the “youth wing” of the Jewish Voice for Peace organization, the only Jewish organization to make the ADL’s list of the top ten anti-Israel groups in the nation. Another was Kiera Feldman, who wrote a snarky piece in The Nation about her own Birthright trip, suggesting that the main idea was “promotion … of flings among participants, or between participants and [Israeli] soldiers” as a form of Zionist mind control. Birthright sponsors admitted to her that bringing together young Jewish people tends to encourage marriage between Jews, which they think is a good thing (Feldman apparently doesn’t). Her article is full of the usual clichés (Gaza is “the largest open-air prison in the world,” “illegal occupation,” etc. ), and there is an air of dishonesty about it — she obviously played a friendly role when she interviewed the sponsors for her article, and of course she happily accepted her free ticket to Israel while planning to ‘expose’ the Zionist plot. “Watch out for the microphone,” Steven Pease told me as I stepped over the cable, en route to the food table. He is a kindly gray-haired man, with a pair of glasses perched atop his head. “Aren’t Jews very accomplished at everything?” I goaded him on. “I thought we were the best at not tripping.” He smiled and answered, “Basketball, the Olympics—very good.” This man apparently cannot be satirized. Birthright provided food for the attendees, and the gang happily abused their hospitality, in a way completely at odds with Jewish (or Arab, for that matter) tradition. They seem to count this as points for their side on the grounds that they are, or at least represent, the oppressed Third World; and therefore deception, theft, almost anything, is justified. Feldman and Blumenthal, of course, have highly privileged backgrounds. Kiera Feldman graduated from Ivy-League Brown University in 2008 (in 2010, the total cost of a year at Brown was $51,360. No wonder she smells and looks expensive!) And Max Blumenthal is the son of Senior Adviser to President Clinton Sidney Blumenthal. Then they began their chanting, which went on until they were, as Feldman says, “gently” removed. Soon, we acquired a disgruntled passerby, an ultra-Orthodox man getting in our respective faces. He shouted down the human mic’s solo shouter, demanding a “dialogue” none of us wanted, utterly derailing the repetition by turning us into a confused clamor. In this way, the human mic is only human. as scapegoats for powerful bankers. The first verse refers to Steven Pease’s book, which suggests that Jews are disproportionately represented in many areas of human achievement. They can’t bear to hear this, because they are afraid it will make the antisemites angry. The Jew must keep a low profile. Despite their claimed ‘Jewish pride’ they actually have none — they accept the antisemitic stereotype of the Jew as a worthless creature and live in fear of the goyim. Although they say they are struggling to prove the stereotype wrong, their fact-free approach to Israel, the way they are prepared to believe absolutely anything ugly about Jews, Israel and Israelis — viz. Feldman’s article about Birthright and Blumenthal’s fantasy about the Mavi Marmara affair — is evidence that they nevertheless believe the irrational stereotypes. …anti-Jewish attitudes in oppressed Jews result from a) internalizing and coming to believe the antisemitic canards of their oppressors, and b) an unrealistic delusion that they have the power to change the behavior of the antisemites by self-reform — by ‘improving’ themselves so as to no longer deserve antisemitic hatred. This explains their contention (expressed by Blumenthal and another woman in the video) that a Jewish state cannot be democratic, and must be ‘racist’: particularism is bad, universalism is good. And it also explains Feldman’s sudden fury at the “ultra-Orthodox man” — precisely the kind of Jew that excites hatred among non-Jews, that hatred that Feldman fears so much that it has pushed her into the arms of the antisemites themselves. So in a sense, these ‘proud Jews’ are nothing of the sort. They are fearful Ghetto Jews, who have swallowed the antisemitic stories of their oppressors hook, line and sinker, and who are engaged in the (impossible) task of trying to prove themselves worthy to those who would as soon as murder them as look at them. Update [15 Nov 1724 PST]: The woman in the picture, whom I had misidentified as Kiera Feldman, is apparently former Brandeis University student and JVP activist Liza Behrendt (she may be a Dostoyevsky fan, since her picture appears on a Facebook page as ‘Lizaveta Prokofyevna’). The real Kiera Feldman appears at 3:50 into the video. 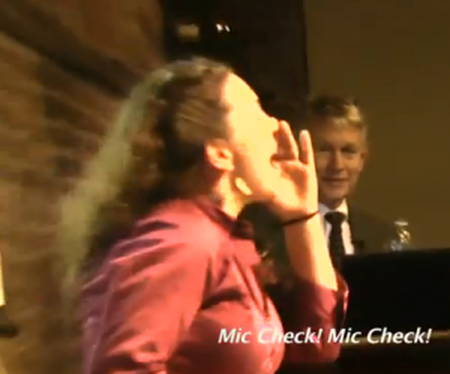 Here’s another video of Behrendt and friends doing their thing, heckling Avi Dichter at Brandeis in April. They certainly believe in free speech, don’t they? It never ceases to amaze me how concepts like peace, justice, fairness, self-determination, human rights, etc. can be appropriated in the service of a movement to deny those things to one tiny nation. 22 Arab nations, Iran, and lately Turkey, with hundreds of millions of people and huge petrodollar resources all doing their best to get the Jews out of the Mideast. And in the name of the Palestinian Arabs, who have generally been treated far worse by those nations than Israel ever did! Not to mention the absurdity of activists who are prepared to believe every antisemitic lie about Israel and Jews but just can’t see the oppression and murder of women, LGBT people, Christians, black Africans, Bahai, you name it, by the paragons of virtue that they support in Hamas, the Muslim Brotherhood, etc. But after all, they are noble savages, oppressed third-world people of color, so you can excuse all that, can’t you? It can’t be racism when the racists define themselves as oppressed, right? You Bay Area radical chic-niks are such idiots! The thought process of these people is foreign to me. They are so deep in their Stalinist conceptual scheme that they can’t see the most obvious facts. Someone suggested that they are like people living in an Orwellian state where all of their inputs are controlled by the regime, and so they end up believing that war is peace, truth is lies, freedom is slavery, Hamas is liberation, the Muslim Brotherhood is democratic, etc. I started watching a movie last night, “The Lives of Others,” about how the technologically sophisticated invasion of people’s lives, political and private — actually, the distinction goes away — can control thought as well as action. Possibly the East German society depicted in the movie was even more intrusive than Orwell’s imagined Oceania. People can be made to think anything, even when they should know better. Of course the Bay Area JVP people — and Michael Lerner, Codepink, etc. — don’t live in such a regime, they live near one of the most beautiful and free cities in the USA, and they have access to all kinds of information. So the totalitarian control is imposed from within and by the tight circles that these people move in. I suppose Communists in the 1930’s could read the Daily Worker and talk politics with other Party members. But they still might be exposed to the ‘bourgeois press’ if they weren’t careful. Today’s electronic media make it possible to totally wall oneself off from any but the most rigorously filtered ideological inputs. Just set your RSS reader to deliver you today’s Mondoweiss, Guardian and Counterpunch. The result are ideological robots that are impervious to being told that they are contradicting themselves. For example, does ‘Queers for Palestine’ sound a little, er, queer, to you given that Hamas jails or even murders homosexuals, while Israel gives them refuge? Then read “Palestinian Queers for BDS.” Your head will explode, but theirs don’t.